Parker Preserve is a wonderful spot for hiking, mountain biking, horseback riding, cross country skiing, and wildlife observation. 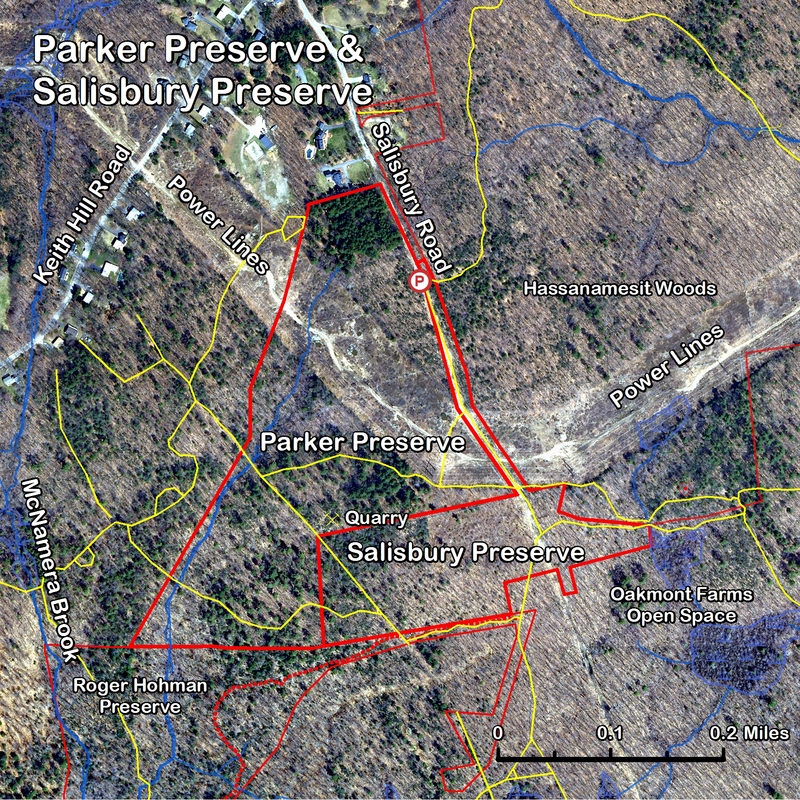 It's part of a large GLT parcel that includes the Salisbury Preserve and the Roger Hohman Sanctuary. Also adjacent are the Town's Hassanamesit Woods, Keith Hill Forest, and Oakmont Farms and the GLT's Platt Preserve. The entire open space area totals over 600 acres. 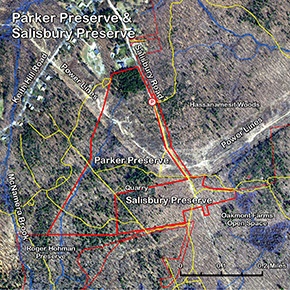 The Parker land was acquired in June 1966 from Ralph B. Parker. It was the Grafton Land Trust's second property. This land is accessed by a path worn 3 feet deep in places - the historic Salisbury Street, also known as Mendon Road. This old path was once the home of a number of members of the Hassanimisco Tribe, who lived in cabins along the street until the early 1900s. Many stone walls in the area attest to its use as pasture land until the late 1800s. In 1975, the Grafton Forest Association had the land cut due to the deteriorating condition of the red pines in this area. "...like most artificially planted stands of red pine, they had converted otherwise productive wildlife habitat into a veritable biological desert." The "messy disaray" of the fall cutting in 1974 established the begining of a new woodland which, unlike red pine, is capable of providing food and shelter for countless speicies of wildlife. (The Land Lovers Bulletin, vol 3, 1975/vol 1, 1978. ).